Principal of Phillipsville Crèche, Ellen Potgieter, takes a moment to reflect on the role that this small crèche has played in the lives of 100’s of children over the last twenty-six years and how with the community of Hankey, continues to benefit from early childhood development (ECD). Potgieter tells of how the children and their families have benefited from having more than just a place of care. She has achieved her NQF Level 5 (Higher Education and Training Certificate in ECD), made possible by the Jeffreys Bay Wind Farm bursary programme. “The ECD training that we received broadened my vision of teaching enormously, especially being able to understand how teaching this age lays fundamental foundations in young children,” said Potgieter who tells of the children that have gone on to make a success of their lives and thereby improving the existence of their families and the broader community. The well-kept yard is managed by the resident gardener, Mr Ben Plaatjies, who also grows vegetables that are consumed by the children. He is particularly pleased that the crèche will be receiving outdoor equipment, donated by the wind farm, to replace the current apparatus, which is in a state of bad repair which makes it unsafe and unsuitable for young children. “My vision for 2019 is to have more children in my centre so that I can educate them and share the knowledge that I have acquired. I really want to reach out to more children, because this is the most important stage in a child’s life, to be educated and stimulated,” concluded Potgieter. Only 53 700 out of 870 900 pre-schoolers attend Early Childhood Development (ECD) centres in the Eastern Cape, according to the Eastern Cape Department of Social Development. 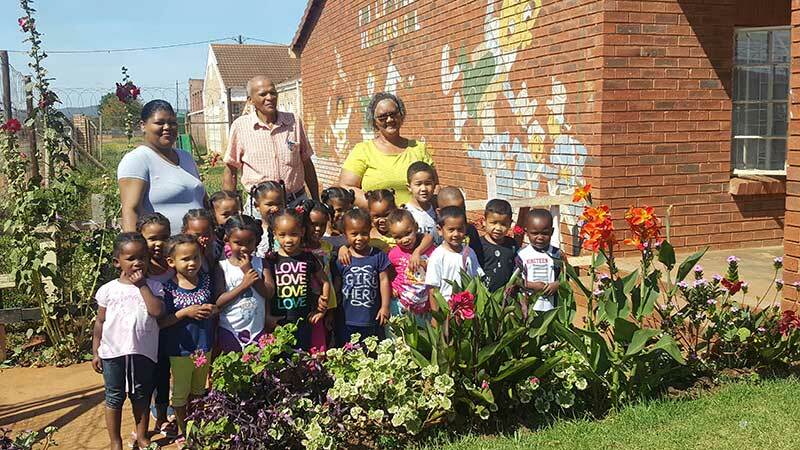 Under-expenditure of the ECD grant in the Eastern Cape Province was highlighted by both the National Treasury and the Department of Social Development in parliament, in May 2018. The Select Committee on Appropriations was told that the Eastern Cape had spent a mere 48.6% of its allocated budget of R56.365 million, during the 4th quarter of the 2017/18 financial year. According to the South African Early Childhood Review, if a four-year-old child is in one of the 20% of poorest households, there’s only a 50% chance of them attending some sort of early education programme. Universal access to schooling in South Africa only starts in Grade R with free schooling. That means a child from a poor family would already be entering at a disadvantage.